There’s surely no better way to fly in and out of Austin than on one of Bolt Jets private charter flights. Infinitely stylish, luxuriously comfortable and with an incredible on-board experience, we take private aviation one step further. We know how important it is to travel well and we also deliver exactly what our clients want. With extensive knowledge in private aviation, we have access to more than 1,200 affordable private chartered jets, so we can advise on any aircraft for any type of trip. Our private charter flights depart from anywhere in the world and with our dedicated concierge team, every flight is seamless from start to finish. We provide private jets for business and leisure, whether for a corporate meeting in Austin, weekend shopping, perhaps a bachelor party – there’s nothing we can’t assist with and truly no better way to arrive; in style, on time with Bolt Jets. Our team also has a helpful concierge service and they are at the end of a telephone 24 hours a day, 7 days a week and 365 days a year. They’re there to help clients with all of the finer detail for business or leisure trips to Austin and they’re advice is invaluable. It’s all part of the Bolt Jets service. Take plenty of summery clothes because Austin in Texas is always hot! There’s so much to do in Austin, while it’s well-known for its music culture, there are also world-class museums to visit and unbelievable shopping. The outdoor spaces are simply stunning and as the weather is so good, there’s a lot to do outside. Whether it’s paddling in the lakes, hiking some of the hills or admiring the greenery in the many parks. Why not hire a bike and visit Zilker Metropolitan Park? It’s one of the city’s most popular places and is home to art museums as well as athletic fields and a large open space. In the water, visitors can swim, canoe or even try digging for fossils at the Austin Nature and Science Center. The park also houses a Botanical Garden and the UMLAUF Sculpture Garden and Museum. Do take swimming gear to Barton Springs Pool which is also within Zilker Metropolitan Park. The natural pool is outdoors and consists of a 3 acre pool formed from underground springs, it’s always warm too. In the evening, spot bats at the Congress Avenue Bridge or if culture is high on the priority list, there are incredible museums to explore such as the Blanton Museum or Art or The Bullock Texas State History Museum. 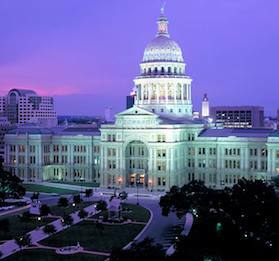 Right in the center of Austin is the State Capitol, larger than the one in Washington by 14 foot. It was opened in 1888 and is a statuesque building in pink granite. Don’t miss out on the Bullock Texas State History Museum which is situated in the University of Texas Austin campus and across the road from The Blanton Museum of Art. There are IMAX movies to enjoy and plenty of exciting exhibits for all the family to enjoy detailing the history of the area. Shoppers won’t be disappointed because there’s a treasure trove of different shopping centers, independent boutiques and local artisan goods to buy. 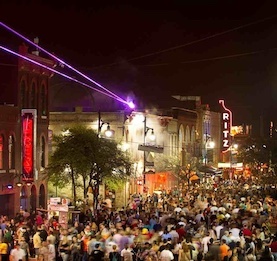 Head downtown for high street favorites and some designer shopping or visit Congress Avenue which is home to numerous shops as well as museums, theaters and restaurants. 2nd Street is great for high fashion and home-grown goods or spend some time in East 6th Street for music memorabilia. The West End is a great place for food shopping and is known for health food as well as some more high street favorites. For hip, funky stores, go to South Congress, just south of the River and often referred to as SOCO. In the evening, after a sumptuous meal head down to Sixth Street, home of live music, bars and clubs and known to be one of the best places to experience entertainment in the world. There’s no doubt that one of the best ways to soak up Austin’s views is from above and what better enjoyment than on-board one of Bolt Jets private charters. See the buildings from the sky and gaze down as the sunsets over this interesting city. As with the shopping, there are plenty of superb restaurants in Austin with something to suit every palate, whether it’s good old American fayre or more exotic cuisine. For a quick bite, head down to KULA and savor Japanese food in a hurry. This is already a very popular chain in the area and there’s plenty on offer from ramen to mocha and of course, sushi favorites. To enjoy French with an American twist, book a table at Bonhomie in Allandale which serves brisket croissant, pommes roti, roasted chicken and even a burger! Finish up with banana split profiteroles, they’re simply divine. Texas is well-known for fried chicken and no visit is complete without sampling it. We’d recommend JT Youngblood’s which although counter service, serves the most delicious tasting Texas-style fried chicken. There are also plenty of other great things to try such as pies, yeast rolls, shakes and sides. Outdoors, there are scenic lakes where people sit and enjoy their JT Youngbloods chicken. Top quality steak is always on the menu at Young’s Steakhouse and is where diners savor filet mignon, porterhouse, lobster and roast lamb. There are plenty of flavorsome sides too, such as bacon macaroni and cheese and good old mashed potato – don’t miss out. Speak to our dedicated concierges team to arrange for dinning options from your choice of any Austin restaurant during your charter flight out of Austin. At Bolt Jets, we always aim to please. All of our private charter flights and helicopter hires to and from Austin are known to be high quality experiences. Our clients often use our concierge team to deal with their business and leisure trips. They’re available at the end of the telephone to make sure every Bolt Jets flight is what it should be, excellent. 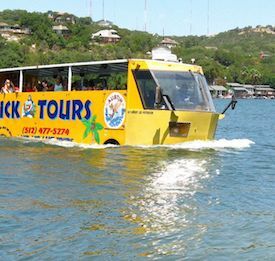 Planning a corporate trip to Austin? Our private charter Jets are the best in the USA and that is why we are the private aviation leaders. We can organize every aspect of any business trip and the concierge team have extensive knowledge on the area. Ask them for the best hotels in Austin and to provide private transfers on arrival, book restaurants or tailor any other detail so every business trip is perfect. There’s simply no other competition for Bolt Jets. There are different airport options when chartering private jets to Austin.